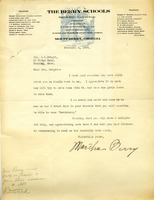 This is a request for Martha Berry to take 12,000 postcards of the State Flower and State Bird of Georgia to give out to visitors and attending or prospecting students. This document is very informal; almost intimate. Currently, business letters are more to the point, and almost cold with no personality. 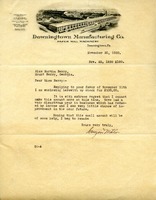 In this letter, the author, Guyon Miller, goes into detail about his struggling business, the Downingtown Manufacturing Company. Miller goes as far to call the year 1930 "disastrous" for his business, and gives a bleak feeling about its future. He also uses the word "herewith" which is rarely heard anymore. If we did not have a date with this document, the use of "herewith" tells us the letter is from a much later date. Throughout the letter, Miller does show compassion and regret for what he feels is a small amount to donate to Berry. 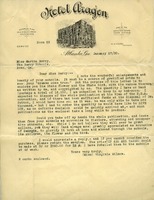 Miller ends the letter by saying, "Hoping that this small amount will be of some help, I beg to remain yours very truly." Again, his wording shows emotion and gives this letter more feeling from the author. He is actually begging Berry to think of him as "yours very truly." Through Miller's words, he displays regret and compassion: regret that he cannot give her more, and mercy to be on good terms with Berry. Intimacy and candidness can be seen throughout the whole letter, especially with its ending. W. W. Weatherford congratulates Martha Berry for receiving the distinguished service award. 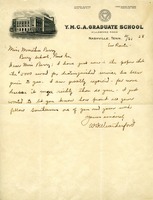 Martha Berry writes to Mrs. S. K. Wright to thank her for the bath cloth and says that she will try to get the girls to make some like it. 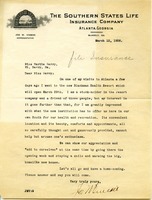 Joe W. Vinson asks Martha Berry to come visit the Blackman Health Resort in Atlanta. 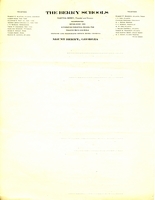 A letterhead with The Berry School's information at the top. There is no letter accompanying this.